Technology has come as a blessing; it has shortened physical and social distances, but at what cost? The social media has brought us closer to friends and family members settled in different parts of the globe. Facebook, Twitter, BBM, among others, keep us connected all the time to almost everyone we have ever known in our life! Instant updates keep us glued to who is doing what, when and where. A co-worker’s recent trip to Spain makes one want leave everything at hand to check out the pictures (it takes just a click). From writing a daily diary at the age of seven and thinking of publishing a book at 15, publishing today is definitely no child’s play! We look back and trace a few young authors from Chandigarh who have grown during the process of working on their books. Sumrit Shahi (19) does not mince words when he talks about his future plans. “I wish to go international one day,” he says. We don’t know what’s more synchronised — his synthesised disco beats or the black and gold co-ordinated look. The only thing out of sync is his unusually late appearance. We give Bappi Lahiri the benefit of doubt, blame the delay on the organisers and roll out the most obvious questions. The Ooh La La and the metallica! By now, the shutters of the cameras and the flash from the yellow metal has settled in. “Wherever I go, I get asked this question. Gold is lucky for me. 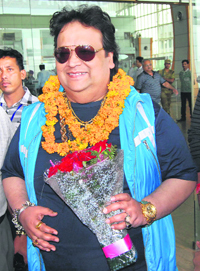 I wear pendants of Gods in gold and that’s the essence of who I am.” In Chandigarh for a performance organised by Sur Sangam, he admits, “It’s not for nothing that they call me the bling bling Bappi Lahiri.” An image and identity that he’s not ready to part with! “I remember when Michael Jackson came to India in 1996, he loved this gold chain of mine and asked for it and I said, ‘You are the King of Pop, you’ve got everything. Many happy returns as you celebrate your birthday. You will be in for a shift of some kind. An urge to develop your personality, appearance and personal skills will make you successful and independent. A strong, healthy self-image makes you more productive, encouraging you to treat others with generosity and sensitivity. But take care of things personally and don't allow others to speak or act for you. A new path will open as an old one fades. It's time to begin a new phase of your life. Everybody knows that television industry is always on tenterhooks because they don’t have episode banks with them. Shoot and telecast of an episode goes neck and neck. 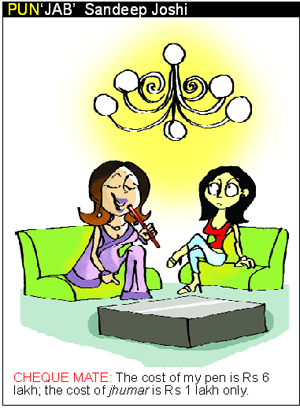 In this scenario, a break of more than 12 days at a stretch is unheard of in the history of daily soaps. But Shashi-Sumeet Production’s daily soap Diya Aur Baati Hum has managed to achieve this impossible feat. The show had gone to Singapore to shoot a different track, to be telecast after a month, with their lead and main actors. It is a hot summer afternoon with no sign of clouds or the rain. Braving the heat, several young and senior artists from Chandigarh came together in the portico of the Consulate General of Canada in Sector 17 to observe Canada Day. Aptly themed Freedom of Expression, the idea was initiated by city-based Suraj Mukhi Sharma, principal promoter of the NGO Artscapes. We are all looking for respite from summer and so are the plants. We live indoors; they brave the outside assault of vagaries of weather. They are also living and the chances of damage and injury are more. This time we feel the summers have been quite harsh and extended. However, going by the predictions, the monsoon is round the corner. When the rains start the gardeners should shift to the damage control mode, to rectify the damage caused to the plants during summer. Maverick filmmaker Anurag Kashyap is known for his hatke cinema that has strokes of sheer genius. His Gangs of Wasseypur has already become an important film with part two on the way. But being recognised in Bollywood was not an easy task for him. He ran out of money soon after he landed in Mumbai and spent his nights sleeping on the beach and on the streets, until lady luck shined on him and his films got recognised. Most of his films, be it Black Friday, Dev D or the unreleased Paanch were very difficult to make because he couldn’t find producers for them and once they were made, they got embroiled in controversies with the Censor Board. Who better than him, then to tell us what it takes to succeed against all odds. There are the happy and wholesome sounds of a Bow Wow and a Meow existing in harmony at Dr Maleeka Sachdev’s residence. “They stay in their respective corners in the room, they aren’t very fond of each other but they share a healthy relationship,” shares the Chandigarh-based skin specialist and a proud owner of a cat and a dog. An eleven year old black coloured cross between Lhasa and a Poodle called Scooby and a seven year old tom called Zappy. “Because he looks so zapped all the time,” she laughs. With the two crazy creatures, it’s a full house. 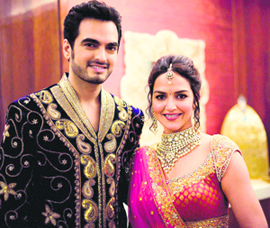 Actress Esha Deol and her fiancé Bharat Takhtani's could not stop gushing about each other at their sangeet ceremony. "I am madly love with him, I can't take my eyes off him," Esha said about her fiancé Bharat, a businessman. Pouring his heart out, Bharat called Esha his "princess for life," and added that that he is "looking forward to having my best life and my most wonderful life with my partner." A beaming Esha was dressed in an orange-red heavily embroidered lehenga-choli by designer Rokcy S, while her beau flaunted a royal-blue embroidered sherwani. Sunglasses, belts, watches and pretty much all different kinds of accessories define this guy. At 21 years of age, Saransh Gulati has just finished his graduation from DAV. We find out what kind of fashion defines this youngster. Rahul Dev Burman (27 June 1939 – 4 January 1994) was an Indian film score composer, who is considered one of the seminal music directors of the Indian film industry. Nicknamed Pancham da, he was the only son of the noted composer SD Burman. RD Burman has been credited with revolutionizing the Bollywood music. He incorporated a wide range of influences. Burman's career coincided with the rise of Rajesh Khanna-starrer youth love stories. After sweating it out for two months and completing a major schedule for his film Mumbai Mirror, actor Sachiin Joshi left for a tour of Europe last week! But while vacationing in Spain, France, Monaco, Italy, United Kingdom and more, what he’s most excited about, is a license to Jet Ski. Known for his rigorous and regular fitness regime, Salman Khan has, till date, managed to keep thousands of female fans swooning over this perfect body. Besides the female fan club, it is also the men folk who look up to Salman as their role model and aspire to have his biceps and abs! We have news that the “action-packed” star is having a neurological problem, something that is affecting his nerves rather badly. If Salman continues to perform too many action stunts in the future the consequences may be dire and he can cause his body permanent damage. The latest craze among the Bollywood music buffs is the song Aa Ante Amalapuram from the upcoming movie Maximum. The track is composed by Devi Sri Prasad of the Dhinka Chika (Ready) fame sung by Malathy and the lyrics are written by Raqeeb Alam. Asin Thottumkal reveals that Bol Bachchan director Rohit Shetty isn’t a huge fan of size-zero. Anil Kapoor had a bit role in Mission: Impossible Ghost Protocol but he went all out to promote it and got flak for it later on. However, Irrfan Khan is being careful. He agreed to promote The Amazing Spiderman only after he saw the movie and figured he had a decent role in it. Shahid Kapoor is taking his younger brother Ishaan everywhere as he promotes his movies. Probably she is taking a cue from Priyanka Chopra. She takes her family along. She often had Parineeti Chopra by her side and today she has become a star. Neha Sharma is ready for the rains. She advises people to wear bright floral dresses, use less make-up, flat shoes, and carry plastic or water-resistant handbags. Arjun Kapoor had a quiet 27th birthday because of his mother's demise earlier this year. His reason to celebrate is his successful debut with Ishaqzaade. The songs of Cocktail are funky and offer quite a variety of genres. Second hand jawaani is the latest one, and Tumhi ho bandhu and Daaru desi are already big hits. Everybody's look and styling has been appreciated. Karisma Kapoor celebrated her birthday in London with Amrita Arora Ladak, Kareena, Malaika, and Manish Malhotra along with family friends. She is more than 36 years old and looks fabulous!